Warder wrote: I will now try and get players from all sites to "cross-play". I wonder about the correspondence format - can't it sometimes be perceived an inconvenient way of playing a game? A tough game will in my experience typically take around 80 moves. With 3 days per correspondence move this makes 80 * 3 days = 8 months to finish one game. Whereas online in real time the same game is typically finished in about one hour. I've now been a member of two correspondence game format sites for 21 days. Even when constantly having 15-20 ongoing games on each site and drawing quickly every time at my turn, for both sites in total only 22 games were completed in these 21 days, about one completed game per day. 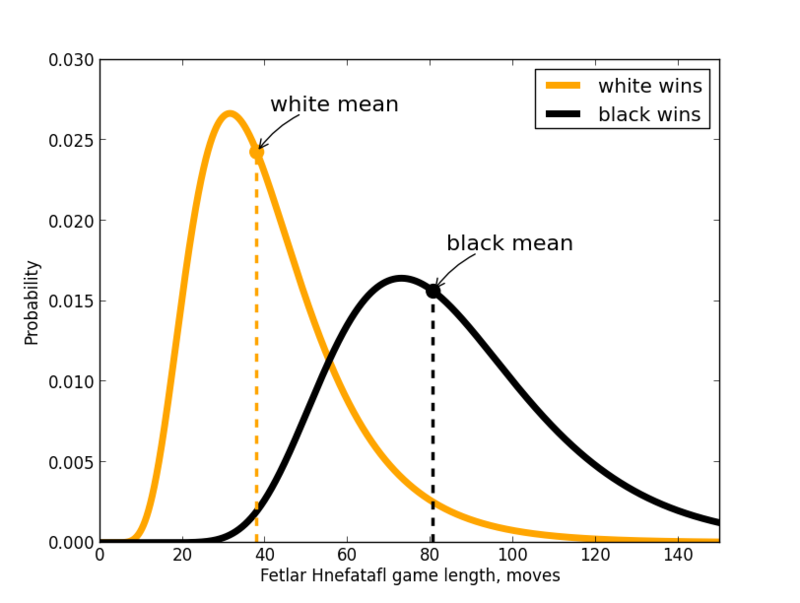 To that the offered Hnefatafl game is of a rather short type; in the 22 games each player did in total 239 moves, in average 11 moves per player per game. In summary about 10 moves per player per day. I the latest 21 active days had 62 completed games, about three completed games per day. To that the most used Hnefatafl games here are of a type which lasts in average about 40 moves per player per game. In summary about 50-100 moves per player per day. So the efficiency of the real time game format seems to be about 5-10 times higher than that of the correspondence format. However, it was an excellent idea to add the correspondence game format to your site, I really appreciate that! Roderich wrote: However, it was an excellent idea to add the correspondence game format to your site, I really appreciate that! You are the first user to try out the new feature in a real game! As I mentioned in another post, I have been long absent from the online gaming site, as I have been immersed in the 9x9 rachuneck tafl on two correspondence sites brainking and dragonsheels. Several good things have come of this. One, is that dragonsheels is now offering Fetlar rules thanks to crusts efforts, and there is now a tournament there. Do come and join in. The fetlar meme is spreading. Lets show them a good game at its best. Another is that while I began hating the correspondence format, I have found it much easier to fit games into even the most hectic of days. Now that my experimenting with rachuneck is pretty much over, I intend to be playing live more again as before, which I do prefer when I can find the time, though supplemented with some correspondence. The Fetlar Hnefatafl Championship tournament 2012 is completed! 156 games were done by 13 participants from 8 countries on 3 continents. Congratulations to Tim Millar for the win! There were 82 white wins, 66 black wins and 8 draws; a fine balance with a slight overweight to white. The draws are 6 center forts, 1 perpetual check and 1 case where white is blocked and cannot move. The game lengths show an interesting regularity: when white wins, the games are nearly precisely half the length of games where black wins. most probable game length 25-58 moves. most probable game length 59-111 moves. The figure illustrates the experience from real games, that white must win fast, or else in a prolongued game black will win. Last edited by Hagbard on Sun Dec 13, 2015 7:53 am, edited 2 times in total. This diagram shows the tafl gaming activity of the latest two years (humans against humans), measured as number of tafl moves done per week. 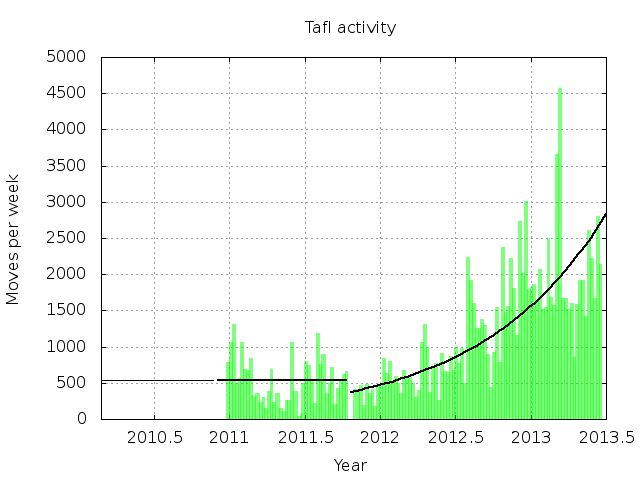 Probably the rapid activity growth during this year (2012) reflects the fundamental changes of technique on the site, which facilitated the gaming. Last edited by Hagbard on Sun Dec 13, 2015 7:57 am, edited 1 time in total. The human-against-human function was ready Feb. 25th 2010. The games of the period Feb. 25th till Dec. 22nd 2010 were not archived, the gaming activity was however very similar to the activity of the first part of year 2011. A best estimate is therefore, that during the unrecorded period were played about 590 games, about 23000 moves. 3000 tafl games, 118000 moves! I remember the inclusion of the 15 days limit to allow for holidays. But am I right in saying that as its just the last 10 moves that count, that one can 'reset' ones amount of days? So if one was at the limit, and then played ten moves quickly, would one zero out ones timeout? This I think is a problem. It can make for a very uneven game play. I for one would prefer a 1.5 day limit on moves, with a 15 day buffer that can be used up. Once its gone, its 1.5 days per move until the end of the game. Otherwise it doesn't apply any real time pressure like a real chess clock. Thanks a lot for the inputs about the timing! I suggest to try Adam's scheme, 1.5 days per move and 15 days buffer. And to let it be the same for all games, both individual games and test tournaments.